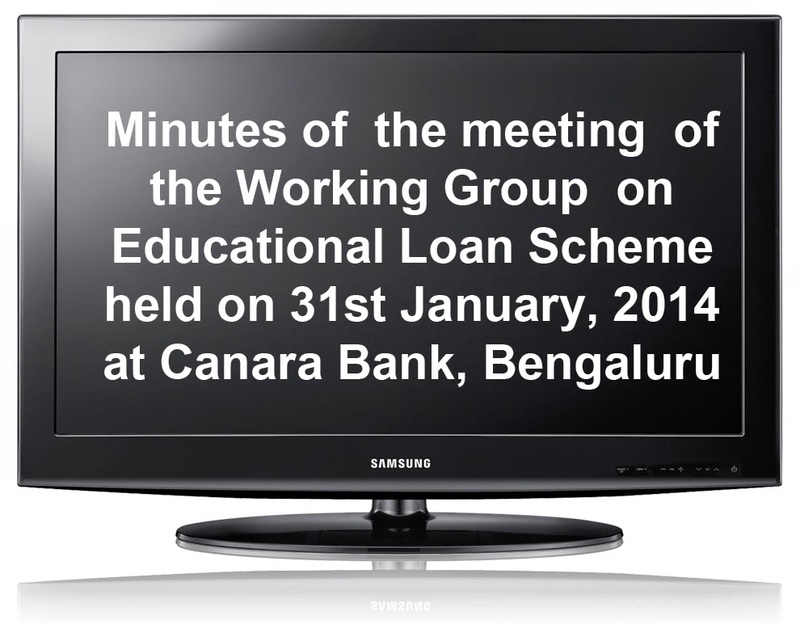 Minutes of the meeting of the Working Group on Education Loan Scheme held on 31st January 2014 at Canara Bank, Bangaloru. In this minutes the working group has discussed the problems relating to the disbursement of interest subsidy. · There is lack of awareness among some Branch Managers about CSIS Scheme which has led to lot of complaints from the student community. · Interest subsidy amount is credited to the accounts of SC Candidates in full and only a partial amount is credited to the accounts of ST and other General Candidates. This partial credit of interest subsidy has led to complaints to Ministry of HRD, Indian Banks’ Association, the concerned Bank, Nodal Bank and Education Loan Task Force. Ministry of HRD to expedite settlement of claims. · FAQs can be developed based on the analysis of the complaints and other issues that are raised by the students, and the same can be placed in the CSIS Web Portal as well as in the web site of the individual Banks. · Lot of queries is coming under RTI. The applicants send a copy of the same to the Ministry and the Nodal Bank and IBA. Queries to be sent directly to the concerned Bank from the Ministry instead of sending it to Nodal Bank so that the concerned Bank can send replies to the queries at the earliest possible time to the applicants. · Issue of refund interest subsidy claims of various Member Banks: Ministry is very serious about this aspect. He requested all the Member Banks not to give scope for refunds in future and ensure proper checks at the branch level. Refund of claims is to be reduced to the minimum extent. · With regard to share of SC/ST and Minority Communities under CSIS Scheme on Education Loans, utilization under these categories is less and not upto the budgeted extent. Banks should pro-actively propagate the Scheme among SC/ST and Minority Communities. There is an apprehension in the minds of Ministry of HRD, Government of India that the EL applications of SC/ST and Minority Communities are not considered sympathetically at branch level. · With regard to the concern expressed by the Government on regional disparities,. he informed that 85% of the claims on Education Loan Interest Subsidy are from Banks located in the Southern Regions. In respect of Northern, Eastern and Western Regions, the amount of interest subsidy is very less. On an analysis, it is observed that the maximum claims of interest subsidy are in the States of Tamil Nadu and Kerala followed by Karnataka and Andhra Pradesh. Locality/ popularity of the Educational Institutions is one of the reasons for the same. Of late, there has been some improvement in the growth of Education Loans in the Northern and Eastern Regions also. Regional disparity has to be reduced to a great extent. Mr. Sahdev Singh, Under Secretary, Ministry of HRD, in his opening remarks, stated that for funds to be released by Government of India, the approval of the Parliament is required. With reference to the request of Nodal Bank for release of funds to the extent of ₹ 2,500 crores for the claim pertaining to last financial year and current financial year, Mr. Sahdev Singh informed that Ministry of HRD will take up this matter with appropriate authority for sanction of the estimated budget submitted by Nodal Bank. Ms. Prabhuta Vyas, Senior Vice President, IBA suggested to take up the issue with Ministry of Finance as Banks are facing lot of problems due to release of funds in tranches. Mr. S.S. Bhat, General Manager stated that the estimate given by Nodal Bank under CSIS is in tune with the claims. He suggested that while finalizing the budget for 2013-14 and 2014-15, the matter may be discussed with the Nodal Bank and IBA for finalization of adequate funds. Member Banks would also inform the required estimated claim amount under the Scheme to the Nodal Bank to get a fair idea about the estimated amount. He stated that the figure relating to amount of claim provided by Nodal Bank is near to the actual claims submitted by Member Banks. Official from State Bank of India informed that the request for Education Loans are on the rise in the State of Bihar and Jharkhand in the recent past and hence, the demand for interest subsidy will be more in the coming days. He requested Ministry of HRD to see that the funds are provided / arranged in full according to the estimate provided by the Nodal Bank. Mr. Sahdev Singh assured that MoHRD will try to convince the Ministry of Finance in this regard. Ms. Prabhuta Vyas, Senior Vice President, IBA was of the view that release of interest subsidy in different percentages to different categories of students by Ministry of HRD is not proper and requested them to release the funds in such a way that interest subsidy claims are settled in full for all categories of students. By doing so, complaints can be reduced to a great extent from the students under CSIS. With this, the following Agenda Items were taken up for discussion. Mr. S. Ramesh, General Manager stated that many Member Banks have requested for submission of pending claims pertaining to earlier FYs 2009-10, 2010-11, 2011-12 and 2012-13 as many eligible students have complied with the condition of submission of Income Certificate obtained from the designated Income Certificate Issuing Authority. Nodal Bank has already made a representation to Ministry of HRD during April 2012, August 2013 and December 2013 to examine the above issue as the problem is faced by all Member Banks. “All pending claims pertaining to the period 1st April, 2009 to 31st March, 2010 and 1st April, 2010 to March 2011 may be submitted by banks to the Nodal Bank during the period 1st April, 2012 to 30th June, 2012. “All pending claims pertaining to the period 1st April, 2009 to 31st March, 2010 and 1st April, 2010 to 31st March, 2011 may be submitted by banks to the Nodal Bank during the period 1st November, 2012 to 30th November, 2012. Accordingly, due to budget constraints, again it is not possible to allow to submit the pending claims for FY 2009-10, 2010-11, 2011-12 and 2012-13 during FY 2013-14. An official from Syndicate Bank suggested to open the Window exclusively for the above purpose during November-December of this year. Ms. Prabhuta Vyas of IBA suggested that as the CSIS was launched effective 1st April, 2009 and as the RRBs and Co-operative Banks were since made aware of the scheme in 2012 only, hence it is logical for MoHRD to consider claims received from RRBs and Co-operative Banks with effect from 1st April, 2009. Also there are chances of left out claims by the student borrowers because of non-submission of income proof certificate / non issuance of proof by the State officials to students. The MoHRD is requested to permit as a One Time measure for banks to submit all their pending claims from all Scheduled Commercial Banks with a pre-derived cut-off date to be decided by the Ministry of HRD. This would definitely go a long way in generating good will among the students community and will encourage the cause of education of students belonging to economically weaker section and will serve the Nation’s cause. Mr. A.K. Das, Deputy General Manager, Canara Bank suggested to give advertisement and wide publicity providing an opportunity to the students to prefer their claims pertaining to the earlier years and giving a date as the deadline beyond which no claim will be entertained. Ms. Prabhuta Vyas, Senior Vice President, IBA suggested to Ministry of HRD, Government of India to give advertisement through DAVP mentioning the salient features of the Scheme on behalf of all the Member Banks as the cost of advertisement incurred by each individual Member Bank would be enormous if they take up the above task on their own. Ms. Prabhuta Vyas stated that students/parents are coming with queries/complaints that while the Scheme itself is not discriminating the eligibility criteria, why at the time of release of interest subsidy, there is discrimination. Moreover, Bank branches are facing operational difficulties in this regard and hence this issue needs to be resolved. She opined that Bank’s problems would be solved to a great extent if the funds are released in equal proportions to all categories of students. Official from State Bank of India also agreed with views of Ms. Prabhuta Vyas and informed that their branches are also facing similar problems with regard to the above aspect. Mr. S. Ramesh, General Manager opined that refund of claims under CSIS Scheme is one issue which is prevalent in almost all Banks. He suggested Member Banks to put in place a proper mechanism to submit the claims properly. He felt that this sort of problems are creeping in due to manual intervention. He stated that Nodal Bank is receiving lot of objections from Ministry of HRD in this regard. Mr. S. Ramesh requested Member Banks to advise the branch officials to ensure that this type of instances is avoided to a maximum extent. Official from Syndicate Bank informed that letters are being issued to the Branch Managers that they would be accountable for such type of instances and any penalty imposed by the Ministry of HRD would be recovered from them only. Ms. Prabhuta Vyas, Senior Vice President, IBA requested the Member Banks to make sure that Branch Managers are aware of the Scheme. Many students are not aware that they have to submit Income Certificates for availing interest subsidy under the Scheme. Many students are of the view that EL under CSIS Scheme is an interest free loan. Students should be made aware that they have to pay interest first and then claim the interest subsidy from the branch by submitting Income Certificate. Mr. K.S. Prabhakara Rao, Advisor, Canara Bank requested Member Banks to obtain Income Certificates from the students at the time of sanction of Education Loans itself instead of calling for Income Certificates at the time of submission of interest subsidy claims as it will save lot of time to the Bankers. Ms. Prabhuta Vyas suggested to put FAQs – Dos and Don’ts for the student borrowers and for the Bank branches in the website of the Banks which will be helpful for the Branch Managers as well as the student community. · double claim submitted and calculation error, etc. He requested that all bankers should ensure that refunds are not made on account of the above mentioned reasons. Mr. S. Ramesh, General Manager suggested all the Member Banks to send the details of refund, if any, as per the format which will be made available in the web portal, shortly by Nodal Bank. Mr. S. Ramesh, General Manager stated that IBA has given the list of eligible courses and the list given by them is not the final one as the same is dynamic. Banks are including some other Courses under CSIS Scheme. It is only an indicative list. He requested that Ministry of HRD may come out with a list of eligible courses under CSIS Scheme. Ms. Prabhuta Vyas opined that there will not any problem if Ministry of HRD continuously updates the list of eligible courses as new courses are being introduced every year and innovation has become the order of the day. In this regard, Mr. Sahdev Singh has intimated that Ministry is regularly writing to UGC, AICTE, MCI, DCI, PCI and the respective Central Government Ministries such as, Agriculture, H&FW, Tourism, Civil Aviation, Social Justice, Labour, Law, Commerce, Coal, Petroleum, Chemical, S&T and Shipping, etc. for displaying the names of accredited Universities/Institutions and recognized professional courses on website. Mr. S. Ramesh, General Manager informed that there is a huge demand from the Co-operative Banks which are financing Education Loans that they should also be included for claiming the interest subsidy under CSIS Scheme. He enquired with the Ministry of HRD and IBA as to whether the scope can be enlarged for covering the interest subsidy. Ms. Prabhuta Vyas, Senior Vice President, IBA reiterated its earlier Managing Committee decision and informed that IBA will be in a position to advise only its members for uploading all information relating to CSI Scheme. As regards, Co-operative Banks which are not member of the IBA, the MoHRD may workout a separate dispensation for submission / payment of claims under the scheme as well as uploading of information relating to students entitlement benefits in the web portal. She further informed that Co-operative Banks which are in the Schedule II List of RBI and are implementing IBA’s Model Education Loan Scheme only are covered and eligible for claiming interest subsidy under CSIS Scheme. She further clarified that in the year, 2011-12, the Ministry of HRD had advised that the Interest Subsidy Scheme would be applicable also to all Co-operative Banks which are listed in the Schedule II of Reserve Bank of India Act, 1934 and as amended from time to time and for the purpose of extending the Interest Subsidy Scheme to Co-operative Banks. Official from Syndicate Bank made a request to Ministry of HRD to seek the views of NABARD in this regard. However, Mr. Sahdev Singh also requested to all for making / give suggestions that - which entities/Cooperative Societies/Banks (i.e. Scheduled/Non-scheduled / State Co-operative / Distt. Co-operatives, etc.) can be covered under the scope of CSIS. Accordingly, MoHRD will write to NABARD for further future course of action, in this respect. With regard to enhancing the income limit from ₹.4.5 lakhs to ₹.6.00 lakhs, Mr. Sahdev Singh stated that there is already a huge burden on the part of the Ministry and the same can be thought of , after some years. With regard to Monitoring of beneficiaries (especially, women, SCs/STs/Minority (Muslims in particular)/Disabled, etc.) of the Scheme, Ms. Vyas opined that keeping in mind the national objective, banks should strive to increase the no. of beneficiaries and that the Bank branches can be sensitized in this regard. Nodal Managers can be designated by the Member Banks for the purpose of monitoring and ensuring maximum coverage of the students belonging to the above category besides crediting the interest subsidy amount to these students’ accounts in time. Mr. S. Ramesh, General Manager, Nodal Bank stated that lot of RTI queries are being received not only by branches of our Bank but also branches of other Banks. He stated that Ministry of HRD, Government of India is forwarding RTI applications pertaining to other Banks also to the Nodal Bank which is not having the required information for disposal of such applications. He also requested the Member Banks to share the good practices adopted by their Banks for administering the Scheme and the initiatives taken by them with regard to recovery of EL/follow up under the Scheme. Ms. Vyas suggested that the complaints / queries may be resolved through robust grievance redressal mechanism within the organisation. The arrangements need to be widely publicised with details of contact persons / escalation matrix etc. All banks are required to sensitise their branches to have these facilities made available / make awareness among students approaching the banks for sanction of the education loan. All banks may provide a toll free line for receipt of complaints and the Number may be prominently displayed in the branch premises. Also, she highlighted that IBA has been constantly receiving an average of 10-15 complaints on non-availability of Interest Subsidy from student community in this regard. Also, MoF, MoHRD, MPs and MLAs also forward various representations received by them and requesting us to take action in the matter. Apart from this, we are receiving a large number of telephone calls / emails on education loan queries / guidance and complaints. However, to simplify the procedure, she requested Ministry of HRD to send the RTI applications / Complaints pertaining to other Banks directly for redressal of the same at the earliest to the concerned banks and not to IBA or Nodal Bank. Later, the special invitees from NUEPA, New Delhi and IIM, Bangalore were requested to inform the outcome of their study of the CSIS Scheme. Ms. Geetha Rani, Associate Professor, NUEPA, speaking on the occasion, stated that the sanctity of submission of Income Certificate by the students for availing interest subsidy under CSIS Scheme needs to be looked into. Further, she stated that though the number of students availing interest subsidy in Tamil Nadu is high, but the per student interest subsidy is less. She requested the Member Banks to provide them the details of Education Loan availed by the students under different categories and the interest subsidy sanctioned by them so that NUEPA can make an effective study on the same and come out with suggestions. Mr. Jayadev, Asst. Professor, IIM, Bangalore, speaking on the occasion, stated that they have already collected data from Canara Bank about CSIS Scheme and are analysing the various aspects of the Scheme. He stated that Government is trying to increase the Gross Enrolment Ratio in the Educational Institutions, due to which Educational Loans have been increasing. He opined that Branch Managers in the Banks must be aware of the eligible courses as well as the recognized Educational Institutions so that it becomes easy for them at the time of claiming interest subsidy. He stated that there should be more clarity with regard to eligible courses and recognized Educational Institutions from Ministry of HRD. When it comes to identification of the potential candidates, Educational Institutions can also play a vital role. Local Banks can have a meeting with the Educational Institutions at the beginning of the calendar year and an Office can be opened in the Educational Institutions with the assistance of one or two persons. He also made a suggestion not to sanction Educational Loans to those SC/ST students who have already been sanctioned Scholarship. Official from IIM, Bangalore further opined that good co-ordination between Banks and Educational Institutions will go a long way in recovery of the Educational Loan from the students.